GS BROWN are a progressive company producing high precision complex components and assemblies, in medium to high volume, for the hydraulics, defence, telecommunications aerospace and instrumentation sectors. BS EN ISO 9002 approved including aerospace manufacture. Sliding Head Turning capacity up to 25.4mm dia utilising 10 axis Tornos Deco machines, Fixed Head Turning up to 52mm bar capacity utilising 8 axis Mazak Turning Centres. 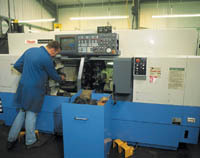 GS BROWN also have a range of Brother High Speed machining centres up to 5 axis capability. GS BROWN also offer grinding, assembly and test facilities and supply product on a consignment stock basis or through kanban supply agreements. Manufacture is controlled by a fully integrated MRP II system which schedules and controls production.